This was sung on an old movie I was recently watching and I wondered where the song originated. This song is believed to have been inspired by Down by the River Liv’d a Maiden by H. S. Thompson. It is considered an old western folk song. The song is believed to have been written by Percy Montrose in 1884. Some sources also attribute it to Barker Bradford. The lyrics reveal that Clementine is the daughter of a miner in the 1849 California Gold Rush. The beginning of the song sounds like a sad ballad in which a bereaved lover is lamenting the loss of his darling. As the verses continue, the incidents mentioned are so ridiculous that it becomes obvious that the song is a tongue-in cheek parody of a sad ballad. The melody is believed to have been an old Spanish ballad, written by Gerald Brenan. The melody was published in the book South from Granada and became popular with the Mexican miners during the Gold Rush. The melody was best known from Romance del Conde Olinos o Niño, a sad love story very popular in Spanish-speaking cultures. No one knows when the song was recorded in English. The 1943 musical of the same name as the song. 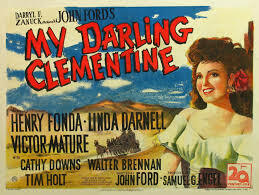 The song has been sung in numerous films over the years, most notably the 1946 film My Darling Clementine. In the Hanna-Barbera cartoons the song is often sung off key by Huckleberry Hound.